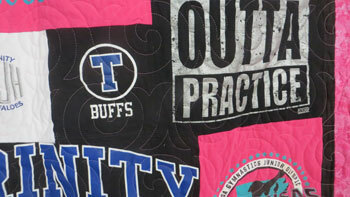 Our Frameless/No Sashing quilt is the most economical version tshirt quilt we offer. 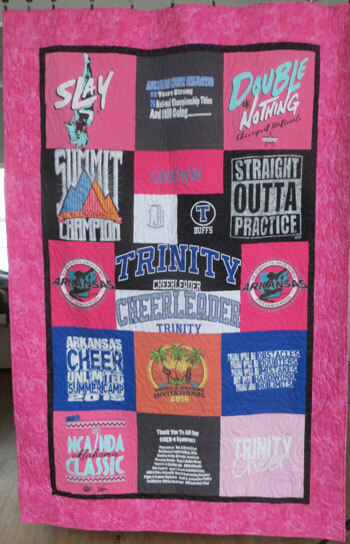 All of the tee shirts are still backed with a 100% cotton stabilizer, and use the same quilt shop high quality fabrics for the back and borders. The quilts are still based on a grid layout, but we do accommodate larger images when needed. We can still combine smaller logo sized images to make a larger block. Since our pricing is based on a 'per block' basis, we charge an 'additional seam' or 'combine' charge instead of the full block price for each shirt. Still the same high quality, with no shortcuts.